I got invited to Shakeism Milkshakes over the weekend and my love for milkshakes ensured that I accepted the invite. As I entered Shakeism, I was welcomed by the owner Muhammad and Nasir, who handles the Propaganda and Distribution arm of the outlet. What does Shakeism stand for? The layout of the outlet is simple with 3 tables that can seat about 4 people and 3 more seats that are kept beside the wall. The wall has been painted yellow with a few black coloured airplanes. 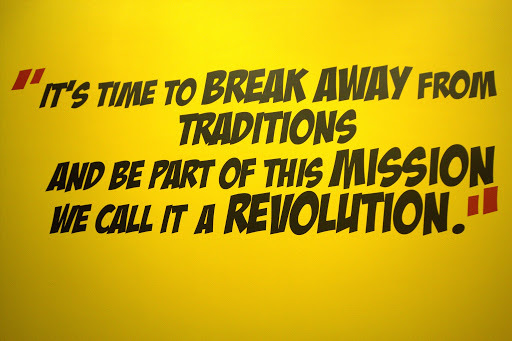 While the other walls tell us what Shakeism stands for. A LED TV hangs just above the counter which shows you the track that is being played and the songs are pretty cool. I heard a number of Lupe Fiasco tracks during my visit including one of my favourites Battle Scars. Moving on to the much awaited milkshakes, the menu will confuse you. 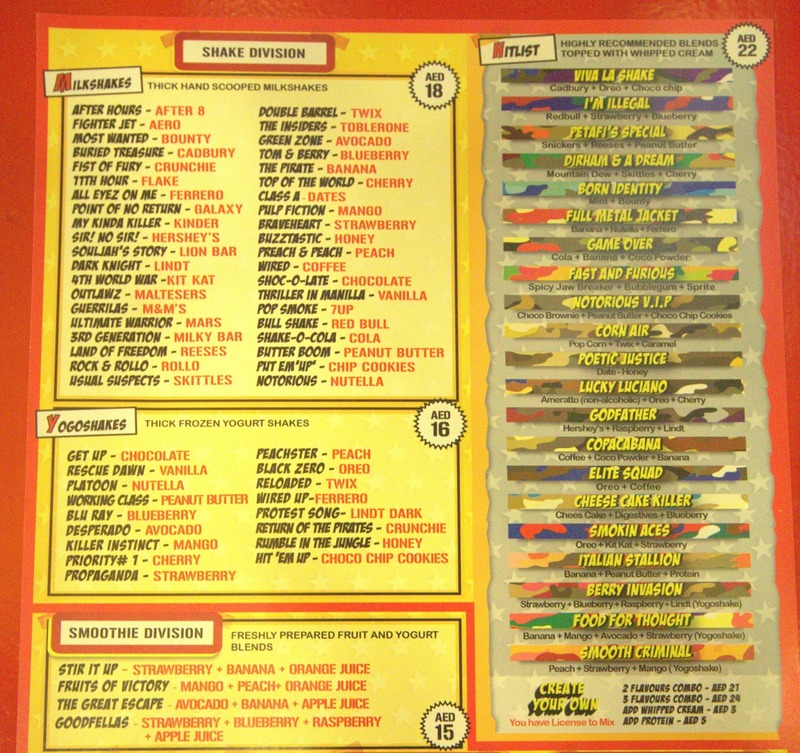 The menu isn’t confusing but the reason for the confusion is the amazing flavours Shakeism has to offer (photograph above). I took a good 5-7 minutes to decide what to try. After some help from Muhammad, I settled for The Cheesecake Killer. The Cheescake Killer lived up to its name. The flavour of Cheesecake was quite evident. The milkshake was thick (just the way it is supposed to be) and tasted good. The milkshake is pretty heavy and fills you up. 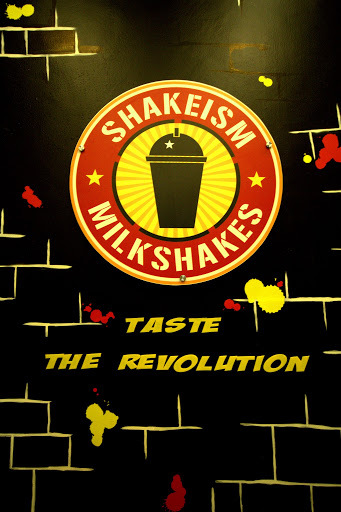 Discussion with Muhammad revealed that other than the milkshakes on the menu, Shakeism tries to innovate every now and then by introducing new flavours. 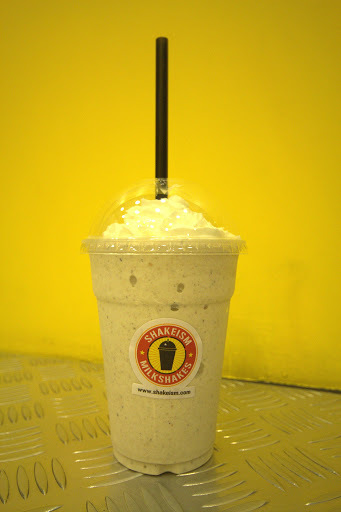 Flavour of the week as they call it, has included the likes of Karak Shake and Black Forest Cake Shake. An item on the menu that caught my attention was Waffles. This was an easy pick for me as I went for the Nutella waffle. I avoided any toppings (though I feel I should have tried them) but did add vanilla ice cream to the order. 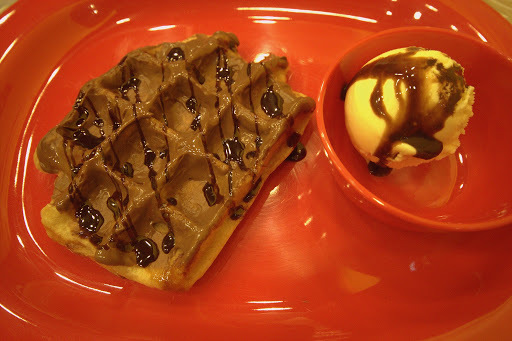 The waffle was delicious though a little less crispy probably due to the warm Nutella on it. However, the highlight for the night was the Vanilla ice cream. I am not a great fan of ice cream but do enjoy having a scoop once in a while. The Vanilla ice cream was amazing and it was one of the best I have ever tasted. I have always had a keen interest in trying food from places where the owner treats the business as his/her baby. The reason for this is that such individuals tend to put in their heart and soul into every bit of work they do. They also value feedback and constantly improve in order to deliver quality. Shakeism Milkshakes is one of those places. I am glad that I managed to visit it or else I would have never discovered a place that makes amazing milkshakes. I was invited to try the food at Shakeism, therefore I have not provided any ratings for the restaurant. All opinions expressed are solely based on my experience and are not influenced by the restaurant or its management in any way. Serves Milkshakes, Smoothies, Waffles etc. Thanks, it was totally amazing. Worth a try. damn that looks good! I have goosebumps just looking at that picture!